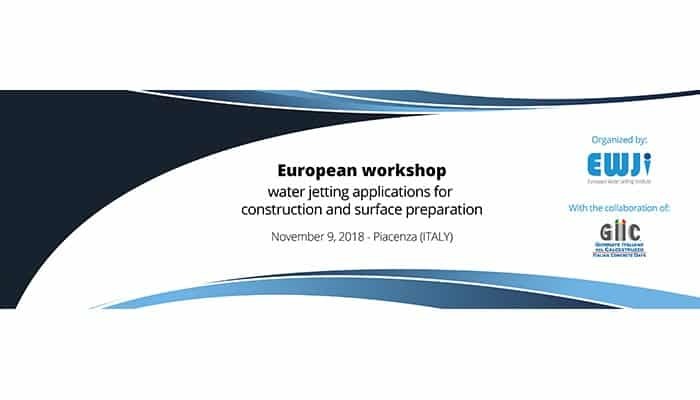 GIC 2018 is coming and EWJI is getting ready to its workshop about water jetting applications for construction and surface preparation. Three international panelists are confirmed to participate in two round tables to talk about the water industry and to generate an open debate. The program of the event is already available on the website of the workshop, where timetable and panelists can be consulted. The workshop will take place on November 9 in the frame of the trade fair GIC 2018 (November 8-10) in Piacenza (Italy). Although the workshop is free of charge, it is required previous registration in the trade fair GIC 2018 website. Alongside with GIC, there will be a wide program of conferences, workshops, and seminars of great interest and relevance, whose organization will be looked after by leading associations, institutions and universities.